Explore the Neolithic Ruins Near St. Ives! Taking a holiday in Cornwall is a fantastic idea for a number of reasons, from its reduced cost compared to overseas holidays to its world-class restaurants, beaches and culture. However, there’s another thing which Cornwall has world renown – its incredible history. Hidden down every side street and etched into its hills are signs of the history and heritage in Cornwall, and a short trip can reveal some incredible locations. Here is a guide to some of the incredible ancient and Neolithic ruins that can be found in and around St Ives, and how long it’ll take you to get there from your luxury self catering home from home with Carbis Bay Holidays. This pre-historic burial site was founded above a stunning clifftop location, and today is an incredible place to visit. Ballowall was utilised throughout the Neolithic and Middle Bronze Age period, and was covered by the spoilage from tin mining until 1878, when it was excavated. That excavation revealed a round chambered cairn, with a covered gallery of around 11 feet, which can still be seen today. To find it, head to St Just. Leaving the Neolithic period behind for a moment, we’d like to draw your attention to the Chysauster Ancient Village, located in New Mill. It’s one of the best-preserved Iron Age villages in England, and was inhabited from 100BC into the 3rd century. It’s currently believed that the village was created by the Cornish Dumnonii tribe, who resided in the area at the time. To date, eight courtyards have been found laid out in two rows of four, alongside a stone house and several outlying buildings. It’s a terrific trip for anyone interested in Iron Age England, and in particular, Cornwall. You’ll find it in New Mill, Penzance – just a short drive from St. Ives. One of the most famous Neolithic settlements in the area, the Carn Brea Settlement dates from around 3900BC. The site was used for thousands of years, and subsequent digs have found everything from Neolithic remains to golden Celtic coins, Bronze Age axes, Roman coins and a great deal more. Head up towards Redruth, where you’ll begin to see it signposted, for a great day out. 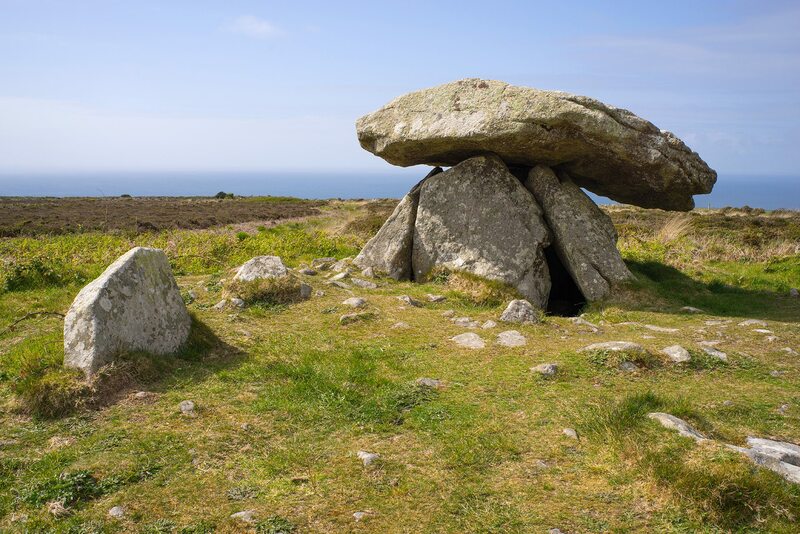 Located not far from the south coast, the Tregiffian Burial Chamber is another fascinating location for those interested in Neolithic activity in Cornwall. This burial chamber features a 15 meter wife mound, edged with kerb stones and a funereal chamber set into the west corner of the mound. Found In Larmorna, the burial chamber is a fantastic excuse to get down to the area, where you’ll also find the stunning Lamorna cove – a location which has inspired artists for thousands of years. By taking the coast road from St Ives B3306 not only will you be able to enjoy the vistas on a one of the most beautiful roads in the country but you can also visit Chun Quoit and Men and Tol. These are some of the best-preserved examples of a class of monuments called “Quoits, Dolmens or Cromlechs”. Dating back as far as the early Neolithic period (3500-2500 BC) they are probably the earliest of any of the prehistoric monuments remaining. Chun Quoit can be seen clearly on the horizon from the B3318 road that runs from Portherras Cross at Pendeen to join the A3071 road to Penzance. Men an Tol is a small formation of standing stones in Cornwall, United Kingdom. It is about three miles northwest of Madron. Probably one of the best known stone circles of the Land’s End Peninsula, the 19 stone circle offers a quick introduction to ancient Cornwall and is only a short walk from the B3315 to Lamorna. Two small car parks offer easy access to the site – no stomping across moorland here! So what are you waiting for? Book yourself onto one of our self-catered holidays and experience the amazing history and heritage that Cornwall has to offer.